The Munker Illusion is offered as yet another example of a so-called optical ‘illusion’. Illusions have historically been offered as proof that we cannot trust our senses and that all ideas that depend upon sense-perception are therefore unreliable, leading to absolute skepticism, solipsism, and subjectivism, ideas that dominate modern philosophy. The interpretation of the Munker effect as an instance of perceptual illusion, is the consequence of failing to grasp the true nature of perception, the nature of what our senses are ‘designed’ to detect and process, and attempting instead to rewrite the laws of perception to meet the philosophical demands for ‘valid’ contact with the ‘real world’, typically implying unmediated or unprocessed interaction with the real properties of the physical world. A typical example of such a demand is the assertion that if our senses were valid they would allow us to sense the real colors, temperatures, density, geometry, odors, sounds of objects ‘in themselves’ and not be limited to the subjective experiences that are the result of processing and filtering the ‘information’ sent to our senses by external objects. To what do Perceptions Correspond? As a consequence, the psychological experiences of such conscious events as ‘color’, ‘sound’, ‘touch’ correspond to complex relational physical constancies (contrasting rations of long to short wavelengths across a visual edge), rather than simple physical local constancies (wavelength, for example). Thus the perception of ‘red’ corresponds not to the detection of light waves in the 620–750 nm range (as many physicists and philosophers would have it), but rather the contrasting ratios of wavelength (or frequencies) across a physical ‘edge’ or ‘optical boundary’. That perception of ‘red’ is always reliable and always tells us exactly what long-short contrasting rations exist at that moment in that given optical direction in the real world. Thus, surprisingly, perception tells us far more than we expect it to tells us. It identifies a physically complex fact and not a physically simple one. While a valid philosophy can tell us that our perceptual awareness of the world is reliable and the necessary basis for conceptual ideation, it is the job of science, not of philosophy to study and understand the underlying causal nature of perception as a psycho-physical-biological developmental capability of the conscious organism. In other words, it is the job of science to discover how our perception of ourselves and the external world, specifically ourselves in relation to the external world, is achieved. There is much science to learn before understanding how the senses give us true reliable perceptual knowledge of the external world. A good place to begin is by reading the works of J. J. Gibson, especially his brilliant and challenging thesis: The Senses Considered as Perceptual Systems as well as his magnum opus, The Ecological Approach to Visual Perception. J. J. Gibson is an advocate of epistemological realism (as contrasted with the many flavors of idealism on the one hand and materialist reductionism on the other). If invariants of the energy flux at the receptors of an organism exist, and if these invariants correspond to the permanent properties of the environment, and if they are the basis of the organism’s perception of the environment instead of the sensory data on which we have thought it based, then I think there is new support for realism in epistemology as well as for a new theory of perception in psychology. – Gibson – New Reasons for Realism, Synthese, 17:2 (1967:juni) p. 162. Both the psychology of perception and the philosophy of perception seem to show a new face when the process is considered at its own level, distinct from that of sensation. Unfamiliar conceptions in physics, anatomy, physiology, psychology and phenomenology are required to clarify the separation and make it plausible. But there have been so many dead ends in the effort to solve the theoretical problems of perception that radical proposals may now be acceptable. – op. cit., p. 171. J. J. Gibson began working on the problems of visual perception with his future wife and collaborator Eleanore J. Gibson whose major extensions of J. J. Gibson’s work was her deep research into perceptual learning. E. J. Gibson extended J. J.’s work reflected in his The Senses Considered. Her first important book was Principles of Perceptual Learning and Development. Later her collaboration with J.J. on ecological visual perception inspired her magnum opus An Ecological Approach to Perceptual Learning and Development. Returning to the issue of sensory illusions, the most important concept to realize is that no theory of perception can be built on theories of perceptual or sensory illusions. Why? For the very same reasons that no theory of biology or physiology can logically be built on the basis of biological functional pathology. Pathological systems are by their very nature malfunctioning systems. Pathology is explained as corruptions of healthy or properly integrated and functioning physical, biological or psychological systems. Illusions are the consequences of the carefully contrived ‘unnatural’, ‘deficient’, ‘constrained’ or ‘restrictive’ presentation of isolated visual (tactile, auditory, etc) sensory ‘stimuli’. It is the very fact that these presentation techniques prevent adequate exercise of the subject’s full perceptual capacities that leads to the ambiguity and vagueness that characterize so-called sensory illusions. When inadequate sensory information is presented to the subject, it should not be surprising that the resulting experience is to that very extent non-veridical and always associated with the feeling of ambiguity and uncertainty. Similarly in the realm of neurophysiology, experimenters typically isolate some part of the nervous system (often using severe isolation) so that only the most primitive sensory-motor phenomenon can occur and be accurately observed and measured. It is a methodological illusion to believe that the results of such anatomical/physiological isolation, such as the extensive experimental work on ‘the reflex arc’, represent the primitive bases for and are revelatory of the neuromuscular principles underlying normal integrated behavior. This approach fails to recognize and appreciate the implications of The Integrative Action of the Nervous System (Sir Charles Sherrington, 1906) . Similar errors occur in the study of embryological development, where local isolated phenomenon are mistakenly taken for fundamental biochemical elements of biogenesis. See the work of Paul A. Weiss, an innovator and mentor in the field of neurophysiology. Weiss once wrote: “Of what do we deprive a system when we dismember it and isolate its component parts, whether bodily or just in our minds? Plainly, of the interrelations that had existed among the parts while they were still united.” – from Paul Weiss, “One Plus One Not Equal Two” in The Neurosciences: A Study Program, pp. 801-821. This fallacy of construction by structural or functional decomposition permeates much of science, particularly biological science leading to may false doctrines and theories. Underlying this general methodology is the dogma of mechanistic reductionism and functional or elemental reductionism, which holds that a system can be fully understood as the additive product of the actions of its individual parts. Isolating sensory receptors thus preventing sensory exploration and proper sensory function can only lead to sensory-motor inadequacy and the common phenomenon of sensory ‘illusions’. We conclude that this method of sensory isolation commits the same methodological errors cited above, leading to fallacious conclusions regarding the functioning of our sensory-motor systems. Color as well as lightness/darkness are the product of the visual systems detecting contrasting rations of long vs. short light wave frequencies and intensities across optical light gradient boundaries. 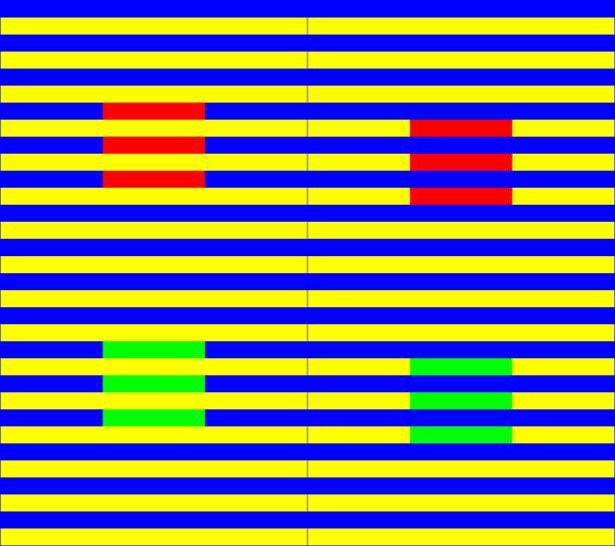 Thus color does not correspond to wave length (this would have no survival value) but rather to contrasting ratios, which always produce the same visual ‘color’ perception and the same visual brightness perception. These insights were first drawn by Edwin H. Land in his brilliant and original their of color vision which he called ‘The Retinex Theory‘. I have written in my thesis on The Causal Basis of Perception, that Ratio detectors are much more stable in a world of dramatic energy fluctuation. The alternatives are: (1) absolute energy detection. (2) difference energy detection. (1) Will destroy the sensors and yield overwhelming and useless information about the external world. (2) Yields better by still quite inadequate and unreliable information about the world. Remember, the purpose of our senses is not to accurately identify absolute energy values, but rather to identify objects in terms of reflected energy gradients. For details, see ‘The Senses Considered as Perceptual Systems’ by James J. Gibson. Comment on FaceBook and copied from the discussion on the causal basis of perception. A profound presentation! Bravo! It’s the scientists unafraid to see reality and what is knowable, (rather than rationalized into an alienating existence by speculative philosophers and sociologists with political Utopian agendas), that will move the human race forward. Junk science, or what I call “political science,” like the “global warming” hysteria, is employed by tyrannical governments to maintain their power over individuals by praying on their common ignorance and fears. Those who bravely think for themselves are the greatest enemies of tyrannies. Jerry, thank you for taking the time to comment on what may seem to many an unimportant or irrelevant topic: the validity of our senses and their base as the foundation of all knowledge. From your comment it is clear that you see the crucial importance of an objective theory of perception and reason to the institution of objective science, science unbiased by political pressure, and therefore free to reason independently about its subject matter. You also see that all countries (America included) realizing the prestige of science, want to control science’s objectives and even its content. How? By funding those hypotheses that serve the political goals of governments regardless of their truth or falsehood. People understand this issue when it comes to religion, thus the Constitutional separation of Church and State, to prevent the State from using man’s passion for religion to force upon The People, through the enactment of laws, and government funding of preferred religions, religious groups and, most importantly for political purposes, preferred religious doctrines. But what about the other institutions of society, science among them? Government corrupts science by funding politically acceptable theories or hypotheses. Those scientists who agree with or are willing to advocate, or proselytize those government approved views, will flourish in the scientific community. How? Through government funding of their projects and the corresponding withholding of funding of opposing projects; government marketing of their theories; and government attacks on opposing theories and scientist who hold those opposing theories. Government regulation and funding of biased science has a bad–and even evil–history. We need not be reminded of the eugenics movement that signed up thousands of scientists around the world. Eugenics is a pseudo-science, a politically motivated theory of the natural inferiority (and therefore undesirability) of certain human traits, and the social groups (including religions and races) who manifest those traits. From the standpoint of eugenics, those traits were seen as dangerous to the flourishing of world-wide society and therefore worthy of eradication through government forces. The result: The German flavor of fascism: Naziism, and the systematic horrifying ‘experimentation’ on countless innocent people who carried the politically unacceptable biological traits. In the end, the systematic extermination of millions of people during the infamous Nazi holocaust. But eugenics is but one example of the political regulation and corruption of science. Biology is most vulnerable, since it has itself embraced (consciously or unconsciously) certain biological doctrines for political purposes. It does not matter whether the doctrines are supported by scientific research or not, for it is the systematic silencing of opposition and, more importantly, blocking from the marketplace of ideas any opposing views held by dissenting scientists. The latest corruption of science through government funding, marketing and censorship is the ‘global warming’ hypothesis, which is funded worldwide to the tune of billions of dollars annually. Why? For the obvious political purpose of justifying government control over the economy through the imposition of arbitrary laws of production and distribution of all conceivable products whose production is dependent on the consumption of any form of energy, and resulting in any form of byproduct (implicitly defined as ‘waste’, implicitly equated with ‘pollution’). This is Marxism implemented through yet another pseudo-science: ‘environmental science’. Once the hoax of global warming was exposed, the socialists created a new ‘evil’ that could never be eradicated for it could never cease to exist: ‘Climate Change.’ The new argument: ‘Climate change is so important to the survival of all forms of life that it cannot be left in the hands of individual corporations or institutions. It must be controlled and regulated by the State.’ Which means, state regulation of all forms of production that consume energy and yield any form of ‘waste’ (again, a euphemism for ‘pollution’)! Again, government has a deadly record when it comes to environmental regulation. One example is the death of millions of people through the outlawing of DDT, which it turns out, is actually a safe and non-poluting substance so necessary for the extermination of malaria. Yet malaria continues to spread and kill more and more people as the DDT ban is maintained, not in the name of science (which has now recanted it original hypotheses regarding the dangers of DDT) but for political purposes: to never give up control of the people once it has be established! There are countless similar stories exposed in many excellent books regarding government caused disasters and catastrophies brought about by the governments use of force to propagate a particular theory and take the seemingly ‘obvious’ actions to protect the environment, too many to cite in the form of a comment. I would argue even further, that the same philosophy of limited government power over the people and there institutions should be applied to education, for the same reason: all free institutions, when allowed to be regulated the the government, become, by that fact alone corrupted. Thus, I would advocate yet another amendment to our Federal Constitution: ‘Government shall pass no laws regulating the freedom of education nor shall it embrace or enforce any theory of education. Nor shall it constrain or impose any content to any educational cirrocumuli.’ Thus the doctrine of ‘freedom of education’ implies: The Separation of Education and the State. For the record. I am not a Libertarian, but am, instead, like most of our Founding Fathers, a political Conservative. To conserve what: Individual freedom within the context of government protection of individual rights. Rights to what? ONLY this: Freedom from coercion by others (including especially government) regarding freedom of thought, trade, religion, education and their application to the institutions of literature, law, art and science.